It's so fun for me to share with you the new book from Martingale featuring mini charm packs. 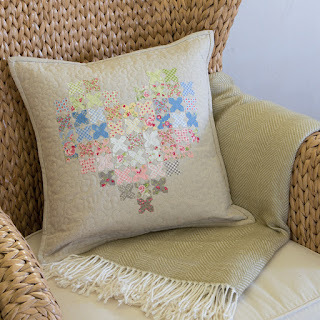 Our creative genius at Moda, Lissa Alexander, has gathered 17 projects from Moda designers who love to play with precuts. The variety is amazing! 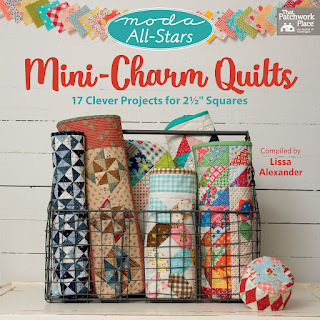 Be sure to check out all the designer's blog posts - and Martingale's All Stars Mini Charms - to see more of the unique quilts in this book. 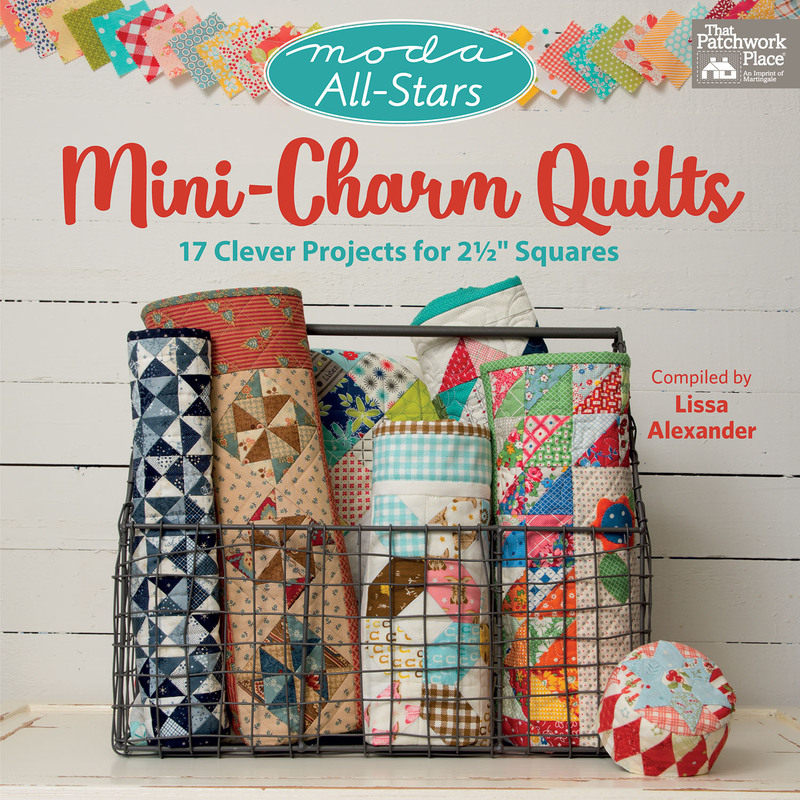 Not only is Mini Charm Quilts full of delightful little quilts, the pictures are pure eye candy. Isn't the wire basket on the cover a great way to display little quilts? I'm going to dig into my cupboard to find a few (and will no doubt have to make a few from the book) to fill a wire basket. This is my offering to the Mini Quilts book. 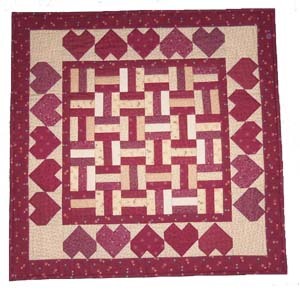 I've used my Five and Dime Layered Patchwork technique, utilizing the pinked edges to layer little tan squares over the 2 1/2" dark squares for a stairstep effect. It goes together so quickly! Perfect for a table top or to tuck into a basket. Love, love this little blue & white beauty. So simple, yet so effective. 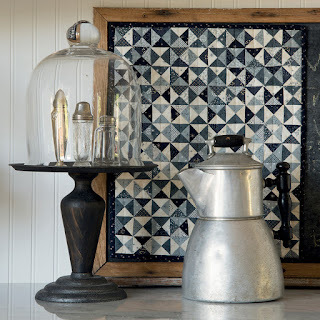 Don't you love the salt shakers under the cloche? It makes the collection look so special. This cute pillow caught my eye right away. The tiny little blocks (adorable) create a heartfelt message that isn't overly cutesy or only just for Valentine's Day (although it would be awesome in scrappy reds). It's a great idea to buy a Mini Charm to match each new quilt you start to have just the right pieces for a coordinating pillow. It gives your home decor that Martha Stewart touch. See anything you like? Wouldn't you love to win an e-copy of the book and a few of my Fresh Cut Flowers Mini Charms? I can make that happen! Comment here and I'll pick a winner when I return from teaching on my quilting cruises in a couple weeks. Lewcrese Shields - I love the fresh picked flowers. Everyone is so bored with winter right now, we all need a little color back in our lives!! 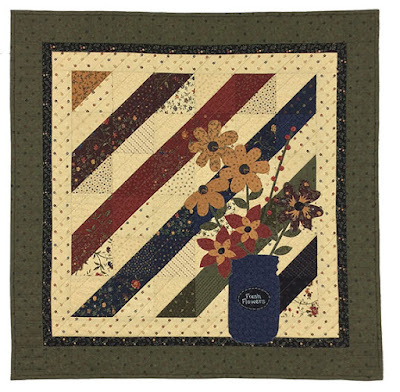 Diane H - The choice of blue for the mason jar is perfect on this beautiful quilt. I'd love some scraps to play with. 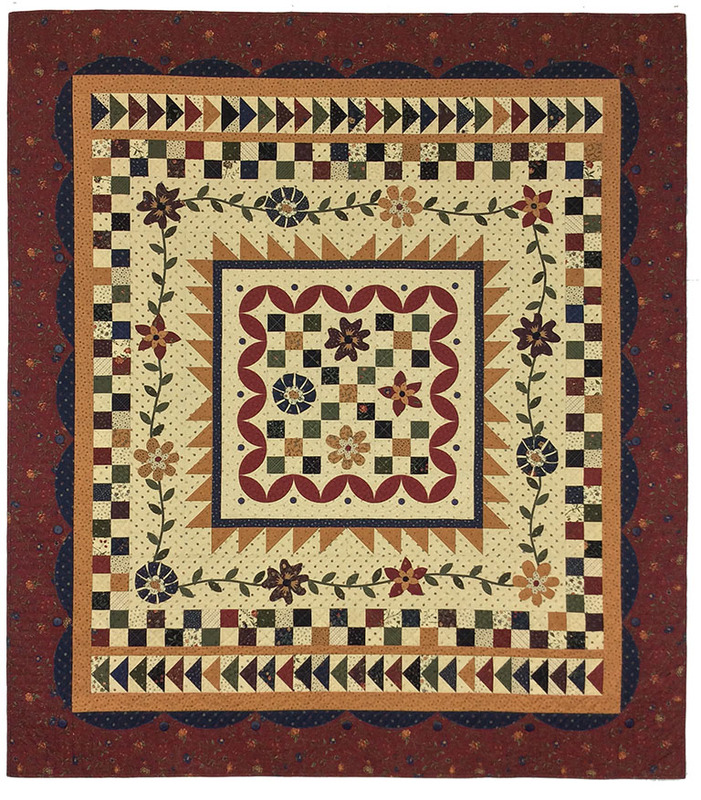 Please email your shipping address to Robert at lynne@ktquilts.com. He'll send it out when we return from cruising. Thanks to all of you that check in on my blog. I so enjoy reading all your comments. 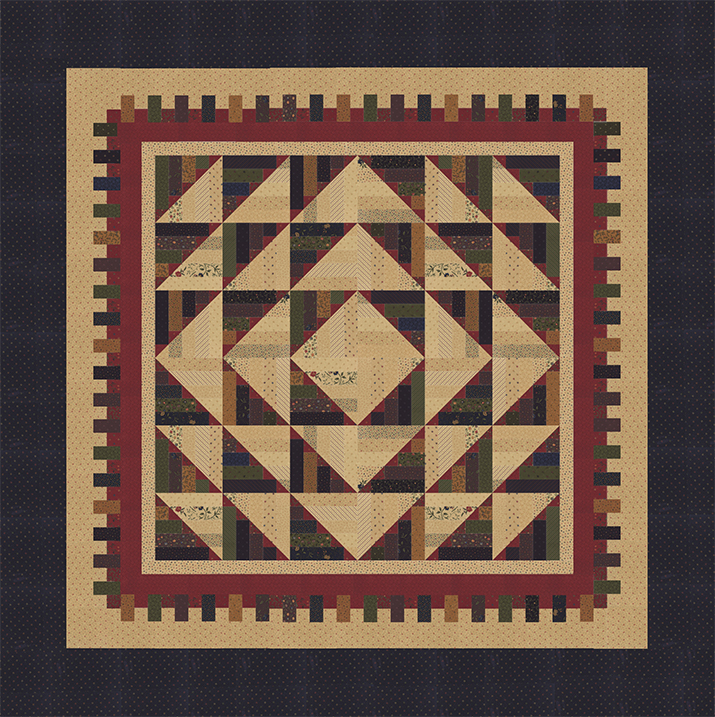 I guess I need to catch up with some of you over-achievers out there and finish my Blockheads quilt in a hurry. 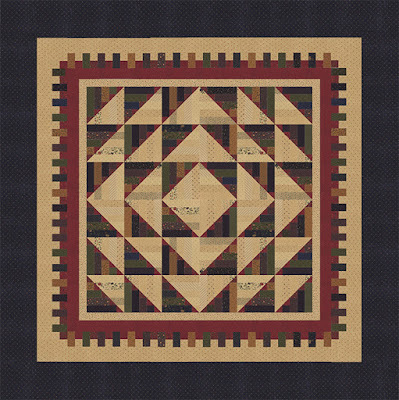 Martingale has asked to publish the blocks and quilts in a book! Woohoo! How exciting is that? It will be great to have all the instructions and inspiration in one place for future reference. But now I'm on a deadline! But wait, there's more! By popular demand, we're going forward with a Blockheads 2 group. There are some very fun ideas floating around for how to change it up and include more designers. Lots more to come so don't miss a post! 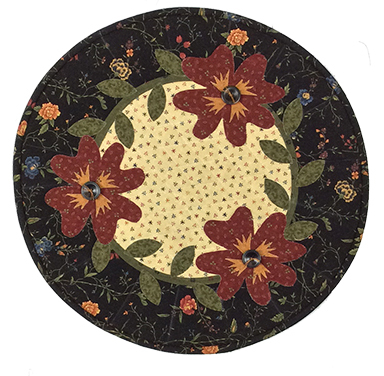 After finishing the Fresh Cut Flowers quilt with the appliqued blooms using our KT Kut-ups precut fusible appliques, there were a few lovely leftovers just perfect for a small project. I chose to feature the "pansy" flower that's purple on the lap quilt and make it red for a not-so-matchy coordinating table topper. Choose your favorite flower from Fresh Cut Flowers and add it to a mini quilt, pillow or bag. Imagine the possibilities! Comment to win a Cut Flowers Mini Table Treats pattern! 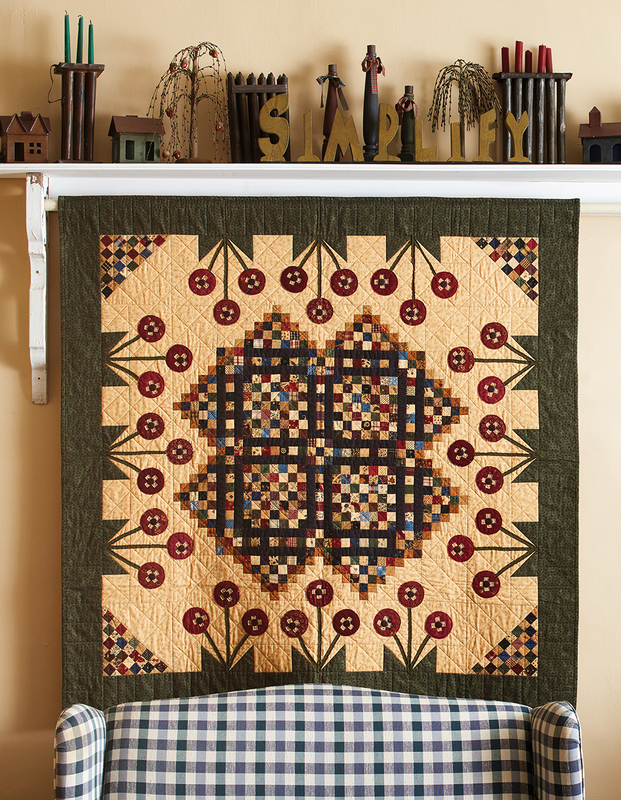 The Fresh Cut Flowers quilt is all about springtime and flowers and soft curves. But I wanted to add a more masculine option for this fabric collection, too. 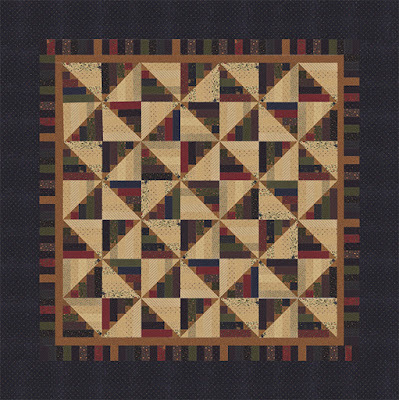 It all started when my brother requested a log cabin quilt when he saw an antique log cabin quilt of mine set in a pinwheel design. 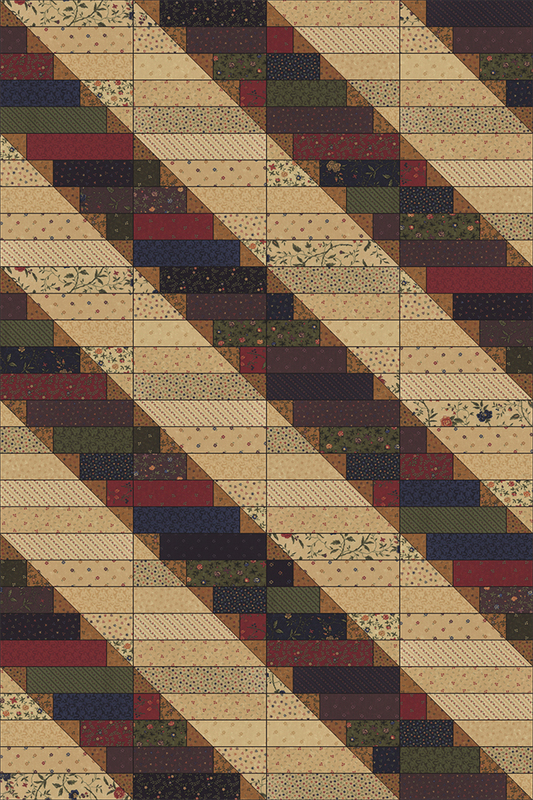 So, really, I love my brother, but I didn't really have time to piece a log cabin quilt with 1/2" strips. I like the variety of settings you can achieve with a log cabin block, but they're so time consuming to piece. With a Jelly Roll and a couple fabrics, I created this block that creates the look without all the time. I added a triangle to one end of the tan strips - either using traditional piecing or my Layered Patchwork for faster results. Add the tan strips to dark strips and you have a log-cabin-wanna-be-block that goes together quickly with all the same setting options. 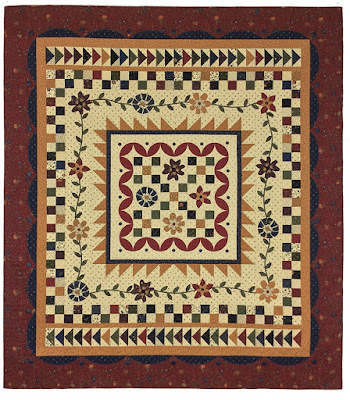 The Windmills and Fence Posts quilts are available in lap size or king/queen size bed quilts. Prefer a furrows setting? It's in here, too. 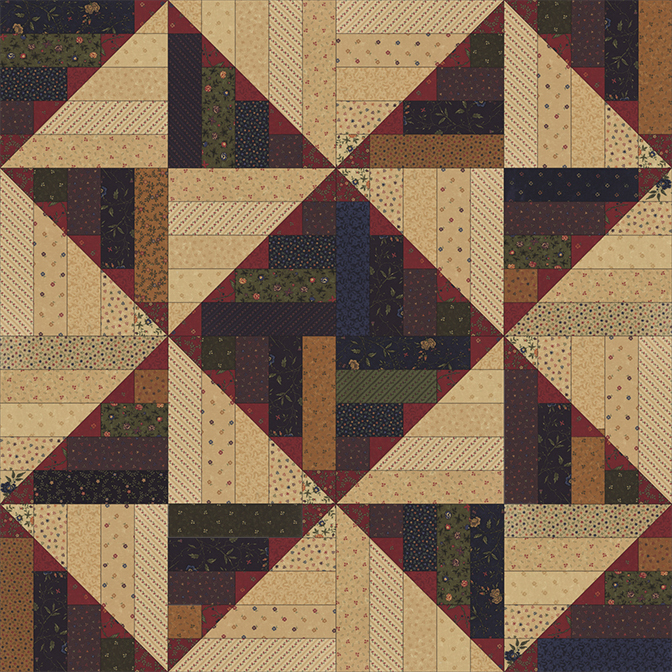 See how different the center of the Windmills quilt looks just by turning the blocks! Love a star quilt? 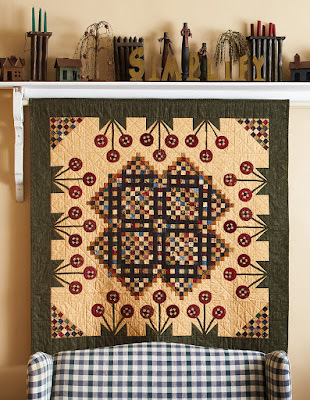 Rearrange the Fence Posts' blocks to create this 40" giant star for the center of your quilt. The same pieced border adds even more punch. Need a bed size quilt? Here are two options using a couple Jelly Rolls and the same simple block. I even had enough JR strips leftover to create a pieced border on the Windmill quilt. King Windmill Quilt 101" x 101"
King Fence Posts Quilt 106" x 106"
Would you like to try your hand at one of these quilts for someone on your list? Comment to win a Windmills & Fence Posts booklet . I'm sending warm wishes to all of you for a day full of love and happiness. And a free pattern! Click HERE for our Hearts to You quilt pattern. It's a good way to try my Layered Patchwork technique in a small project with quick results. Give a hug. Make someone's day! Thanks for including your email address. 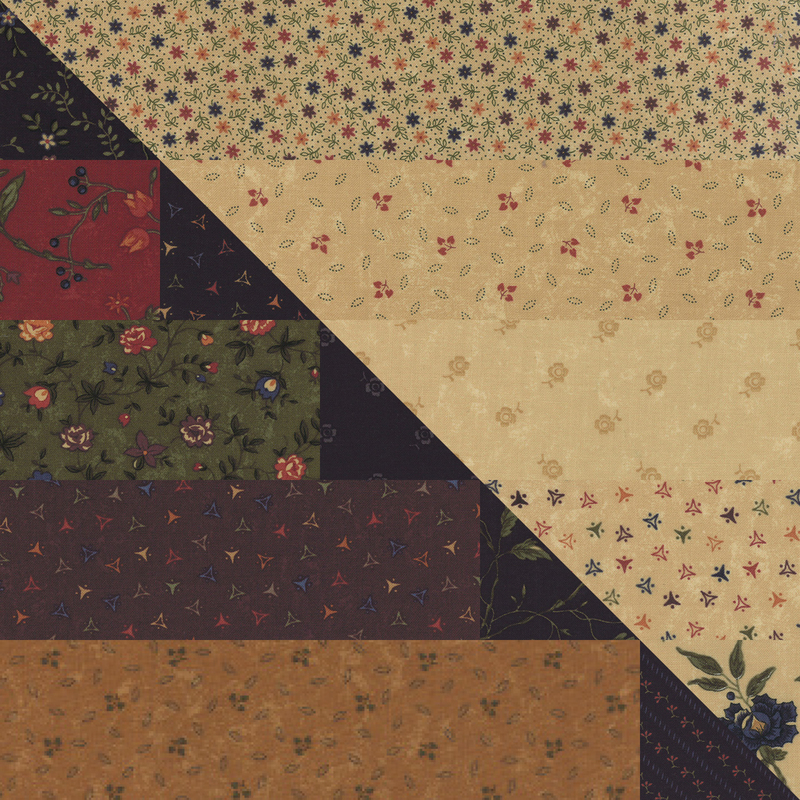 I enjoy the challenge of designing a quilt for each fabric collection based on the prints, colors and theme in the line. For Fresh Cut Flowers, I knew right away I wanted a jar full of blooms, but didn't know what the perfect background would be. It didn't take long to realize that simple was the way to go. I cut all the charm squares in half to create 2 triangles and began the process of laying them out every which way I could imagine. The diagonal setting fell into place because of the numbers of each of the colors in the charm pack. It's one of my new favorite charm patterns! We have KT Kut-ups precut fusible applique packs for U-Pick or kits that include the Kut-ups and buttons. Watch for them as soon as we have Fresh Cut Flowers in the store mid-March. Find the U-Pick charm pattern HERE. This week, comment to win a U-Pick Flowers charm pattern OR another box of KT scraps. We'll select 2 winners next week. Baby, it's cold outside! 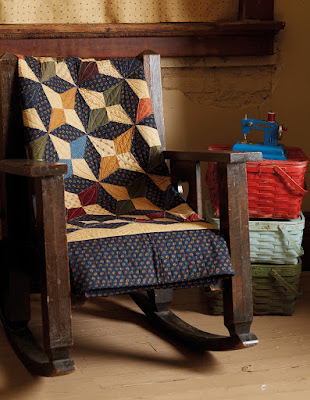 Now is the perfect time to curl up in your most comfy chair with a cup of your favorite warm beverage and new quilting book to inspire your creativity. Need a recommendation? 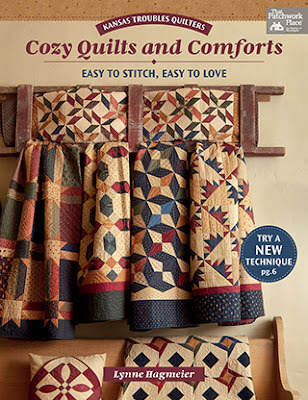 My new Cozy Quilts and Comforts book. 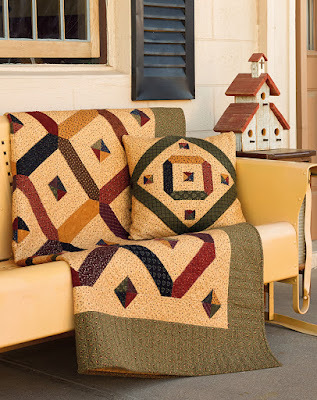 There are more than a dozen ideas for lap & bed size quilts, runners, table toppers, wall quilts and pillows in traditional piecing and my Layered Patchwork technique. Here are a few of the projects included in the book, published by my friends at Martingale. All of the pictures in the book were taken at the KT Retreat upstairs over the KT Quilt Shop. Note the ladder used to hang multiple quilts for a fun display. I usually have a collection of vintage red/white/blue quilts and bunting draped on the ladder. Checkerboard Garden. 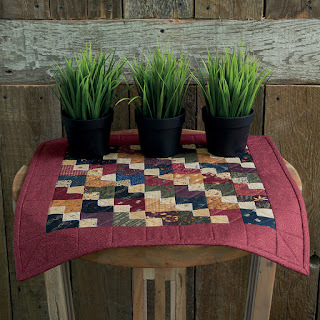 One inch squares plus easy fusible applique creates a primitive garden perfect for your spring decorating. Nothing is more cozy and cuddly than Moda's flannels. This easy quilt goes together in a flash. 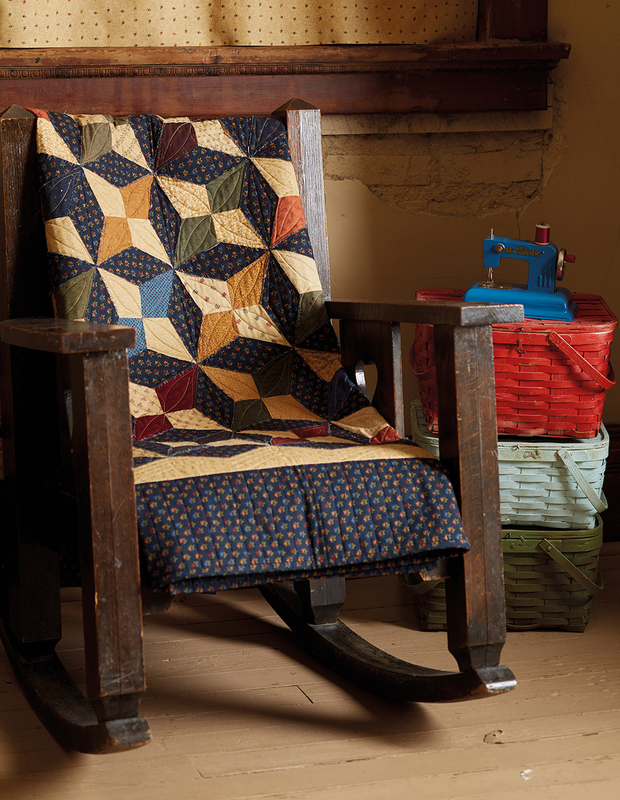 The vintage glider is a favorite spot for husband's patiently waiting for their wives in the quilt shop. I love that I was able to include a variety of blocks and techniques, including fusible applique featuring our KT templates. Our Diamond template creates the Kaleidescope block using a 4-patch. This cozy nook is in the bedroom upstairs in the KT Retreat. Comment to win one of (3) copies of Cozy Quilts and Comforts. Books will be shipped the middle of March after we return from our cruises.